I was recently reading a thread on the Agile Alliance group on Linked In where Matthew Weaver was asking for some thoughts about why Waterfall is demeaned by those that follow Agile and Scrum. The thread to me got very interested when Scott Ambler brought some metrics to the argument. 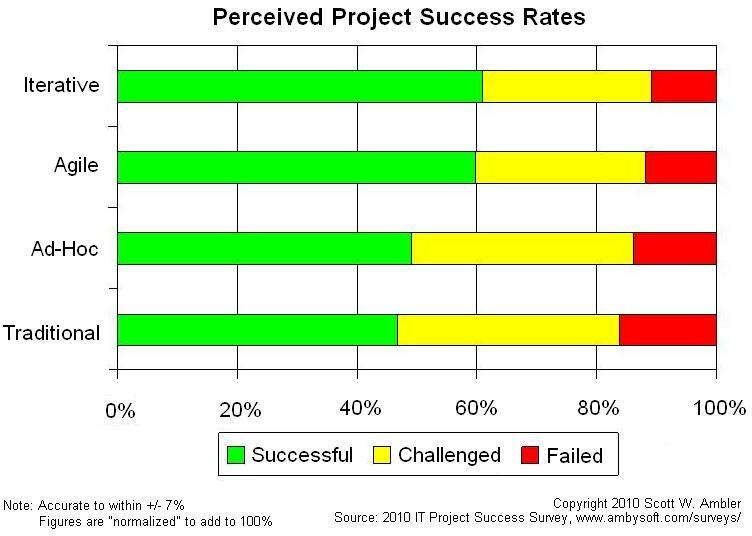 Challenged: A project is considered challenged if a solution was delivered but the team did not fully meet all of the project’s success criteria within acceptable ranges. Failed: The project team did not deliver a solution. Ad-hoc: The team does not follow a defined process. I must admit I was a little shocked by this graph. The variance between methodologies (please note I loosely use the word methodologies) and end results were really not different and a niggle grew in my heart – was Agile really no better than Waterfall? Was the likes of RUP better than Agile, seriously?!? Is the existence of no approach, chaos or chaordism (a sub-orderly version of chaos) really just ten percent less successful? When you look at results there is only a 15% variation at maximum between all of the methodologies – this is by no means significant. When you take into account that non Agile methodologies are tackling the more challenging project types, is it any wonder that traditional and ad-hoc approaches have a higher failure and challenge rate? At face value, these metrics are proof that we are fighting an unneccessary battle. These metrics are really suggesting that I should find a new career path tomorrow and stop blogging right now. Something is missing, or maybe I’m really more dogmatic then I think. Let me make a little adj unct and go back to the future. I remember reading in depth the Cutter IT Journal Great Methodologies Debate in 2002 (side note this is a facinating read in retrospect). One article, ‘Agile Versus Traditional: Make Love, Not War!’ by Robert Glass took my fancy. As an ex-Waterfallist seeking mental support I saw this article as thoughtful. Not really for the content that it was but for the concept. Given that Agilists back then were referred to as ‘anarchists’, ‘revolutionists’ or as I heard often ‘cowboys’ an Agile implementation beyond a single team was fraught with great risk. These were the days that PMOs have massive amounts of power and control. These were the days that you had to placate Waterfall to some extent so that your transformation would not be quashed by the mass of old school methodologists. This arcticle was a means to support that. We had to pretend it was love and not war even though deep in our hearts we knew it wasn’t really the truth. People hate change and Agile was without a doubt a big threat on the change-o-meter. But my Agile brothers and sisters – these days are gone! We don’t have to hide behind the big brother anymore. This is war! And until this strange beast of a methodology that was based upon building construction is purely a myth I will not rest in my war. I will not take Scott Ambler’s logical, sound metrics and ignore the passion that I know is in my heart! I /spit on these metrics (no really Scott I don’t /hugs). So where do I think there is something missing in this sound foundation? Well obviously over 170 people lied. Then you might think that the term successful meant it was delivered but useless to the end user. Alas, when you read the questions and survey monkey results you see that actually most of the respondants were really passionate about getting the right result and responding to change. So why do I feel so strongly about my war chant? I think there are two key elements missing in the survey. Number One: Were the respondants really, I mean really, doing the methodology they thought they were? I only say this because all too often I see teams that say they are doing Agile and when you delve into it in some detail you find that they are doing Chaos or Chaordism. What I would have loved to have seen was some form of maturity assessment against practices to see whether what they thought they were doing was really the truth. Number Two: The big ‘A’. Out of the four methodologies in the survey (yes, yes Ad-hoc isn’t a methodology) only Agile is more than just a set of process steps and practices. ‘A’gile certainly has some underlying practices based upon the model(s) that you choose the implement but in addition Agile gives us core beliefs (manifesto), principles and values. This is what I feel sets it apart from the rest. We all know that emotional intelligence and treating people like assets rather than pieces on a chessboard makes common sense but Agile puts this into the forefront of everything. I truely believe that it is this focus on beliefs, principles, values, the way that it empowers people through servant-leadership, that results in Agile teams feeling more engaged. Engagement and fun are such highly intangible results that make or break people’s day by day enjoyment with respect to where they work. I would have loved to have seen the survey ask this question and where those teams sat against Industry benchmarks of engagement. It is this engagement, passion, and focus on more than just processes and practices that sets Agile apart, that makes me fight this war so hard. 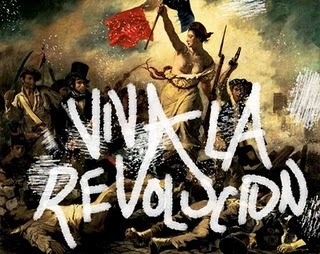 Viva La Revolution brothers and sisters! I’d tend to agree with you that Agile is often done poorly – many ‘Agile’ teams seem to run in to a ‘no-doc iterative zombie’ mode, blindly turning their head away from failing builds, ignored tests and insidious tech debt. This isn’t a new discussion – in 2004 Martin Fowler’s description of “the ‘code and fix’ nightmare, where the bugs become exponentially more expensive to fix as the project goes on”… is even more scary when you read it today! I think Ron Jeffries once said that XP gets traction once > 50% of your dev team can do basic TDD and refactoring. IMHO I don’t see that happening very often! As an example, there’s a book out there called “xUnit Test Patterns” by a Mezaros which I think is one of those *must read* architecture books. Most tech people I know haven’t read it, despite the fact that it contains critical knowledge that managers, developers, testers and architects need to acquire before they can hope to succeed in test-oriented evolutionary approaches. It’s a bit like having devs that don’t know OO… scary. It will be interesting to see how these numbers change as Agile becomes better understood, and managers realise the critical need to train teams in evolutionary design practices.